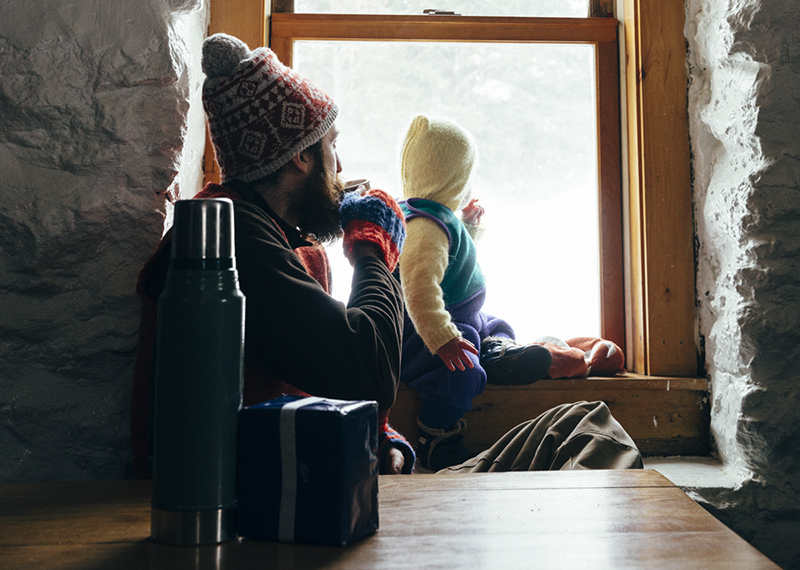 Brady RobinsonGet hygge with it: A father and son at Carter Notch Hut practice the Scandinavian principle of embracing winter. Many American families approach the snow and cold of winter as something to be endured, even feared. Scandinavian families, on the other hand, approach the cold as something to be embraced and enjoyed, and they even have vocabulary for it. The Danish word hygge, pronounced hoo-guh, describes the pursuit of joy and coziness, even when it’s dark and snowy out—which can be much of the year in Scandinavia. Connected to hygge is another idea: friluftsliv. The word is Norwegian for “free air life” or “life outside.” Together, these two words mean that families in that part of the world see no barriers, weather or otherwise, to deep engagement with the outdoors year-round. Erik Shonstrom, an outdoor youth educator and instructor at Champlain College in Vermont, has integrated friluftsliv into his youth programs, as well as two books: Wild Curiosity and The Indoor Epidemic. He says friluftsliv families are more active, positive, and connected to one another, even when the trees are bare and the windows frosted. Instagram feeds suggest that enjoying winter outdoors means embarking on an ice fishing expedition or a backcountry ski trip. Not so, says Shonstrom; enjoying the outdoors with kids in winter simply means walking out your front door. Embedded within friluftsliv is a sense of timelessness and play, Shonstrom says. Allowing children unstructured time outdoors in winter permits them to engage in deep, imaginative play. Shonstrom says that while adults are goal-oriented (summit the hill, ski the loop, fish the pond), kids revel in the simplicity of being in nature. Why does friluftsliv work in Danish and Norwegian families? Because it’s baked into both national and family culture. For families in AMC’s region, a “free air life” could mean a wintertime city park exploration with the Outdoors Rx program in Boston or joining a chapter-organized family weekend at Mohican Outdoor Center in New Jersey. Or it could mean walking out the back door. Shonstrom’s 10-year-old son, Fin, now expects that after dinner, he and his dad are headed outside to burn off the day’s last minutes of light, no matter the season. Read our pointers on dressing kids for winter play. Find a winter outing for your family.